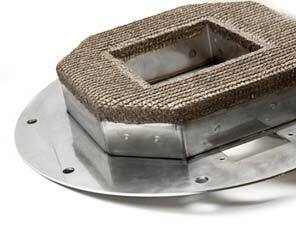 Ceramic gas burners are limited by the size and availability of the ceramic components but metal fibre gas burners can be constructed to almost any size, shape and output. Size and shape is so much more flexible: a large flat burner can now be as little as 50mm thick, though pre-mix burners still need a built in fan and controller. If you have an unusual heating or drying application don't be put off by conventional thinking on gas burners. Give us a call and test our ingenuity!